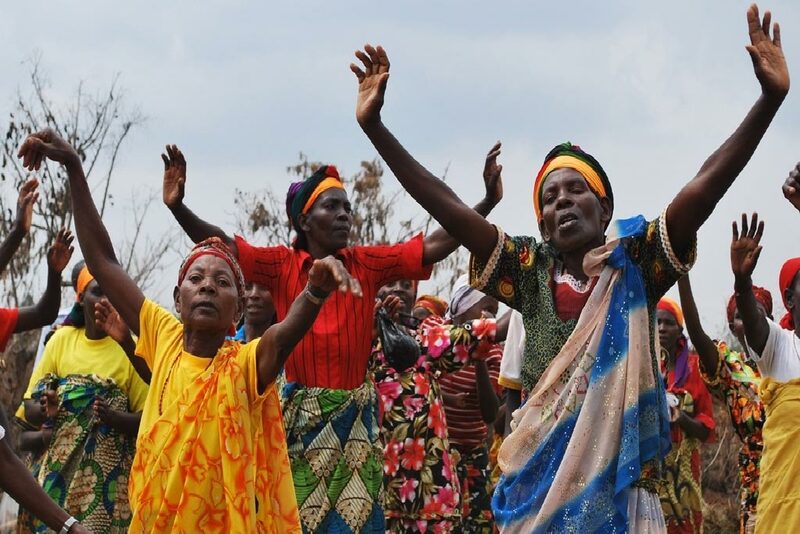 Over half a million smallholder farmers in the Great Lakes region of East and Central Africa have been lifted out of poverty. This is partly due to 10 years of research, capacity building, and networking activities of the Consortium for Improving Agriculture-based Livelihoods in Central Africa (CIALCA) that has seen over 25 innovative agricultural technologies developed and disseminated. 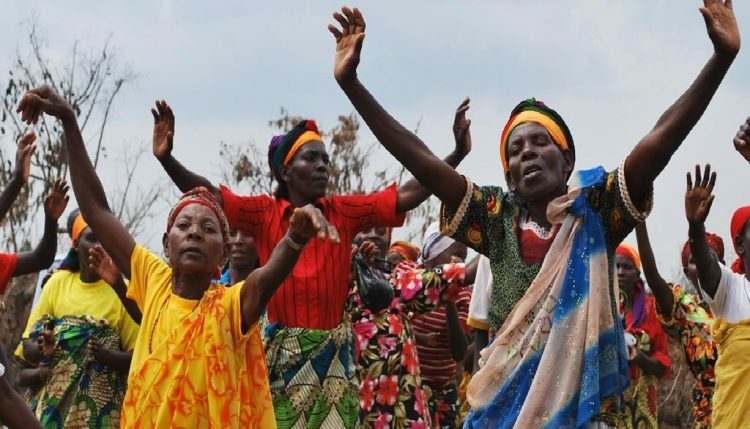 Women of ‘Tugurakire kitoki’ farmers group give a hearty welcome to visitors in their banana field. In its 10 years CIALCA has lifted 560,000 smallholder farmers out of poverty. Staff, partners, and friends of CIALCA drawn from Burundi, DR Congo, and Rwanda, celebrated this achievement at a side event to mark CIALCA’s 10th anniversary held alongside the 7th African Agriculture Science Week organized by the Forum for Agriculture Research in Africa (FARA), 13–16 June. CIALCA is led by IITA and Bioversity International and was created in 2006 when the Belgian Directorate General for Development Cooperation (DGD) approved three separate proposals from the two institutions and the International Center for Tropical Agriculture (CIAT), all focusing on improving agricultural productivity, incomes, and sustainability for smallholders in the Great Lakes Region. “A lot of technologies have come out of CIALCA’s research-for-development efforts, which have been widely disseminated and adopted by our smallholder farmers to improve their food security, nutrition, and incomes. “These include high-yielding improved varieties of banana and legumes, control of deadly pests and diseases such as the Banana Xanthomonus wilt, as well as appropriate soil fertility management practices,” said Geraldine Mukeshimana, Rwanda’s Minister of Agriculture and Animal Resources as she congratulated CIALCA in a speech given on her behalf by Charles Murekezi, Director General of Agriculture Development at the Agriculture Ministry. The Ambassador of the Kingdom of Belgium in Rwanda, His Excellency Arnout Pauwels, who was also among the dignitaries at the event, praised CIALCA for supporting the national agricultural systems in the three countries to engage in dialog and share lessons learned in addressing their common agricultural challenges with each other and other national and international partners. “The great partnerships and networks created at the local, national, and regional levels have been instrumental in the success of CIALCA”, said the Ambassador. The capacity building efforts of the initiative were also noted as instrumental in ensuring the sustainability of the successes achieved. “Over 20 PhD and 35 MSc students have been trained; many of them now hold key positions in the national agricultural institutes in Burundi, DR Congo, and Rwanda. “The initiative also trained over 1000 extension staff of nongovernmental and farmers organizations,” said Kenton Dashiell, IITA Deputy Director General for Partnership for Delivery. “CIALCA has undergone various transformations over the 10 years, adapting to changing farmer and partner needs and circumstances,” said Piet van Asten, a Systems Agronomist with IITA while giving an overview of the CIALCA initiative. In its first phase, CIALCA focused on developing and adapting technologies for improving production systems, while in the second phase more investment went into scaling up and out these technologies through sustained communi­cation and extension efforts. 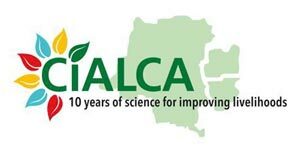 In its third phase CIALCA became part of Humidtropics, a CGIAR Research Program led by IITA and a new angle was added to its research―the creation of multi-stakeholder platforms to provide the necessary institutional support for innovation and scaling. The focus moved beyond single crops and value chains to livelihood and “whole farm productivity” improvement. The promotion of technologies and livelihood improvement were now guided by understanding and using diversity within the farming community. This in turn strengthened the role of women and youth in agricultural development. Collective learning and multi-stakeholder engagement have now become the bread and butter of CIALCA. From all these activities significant impact was made in efforts to reduce poverty: “We were pleasantly surprised with the findings of an impact study on CIALCA that established that the initiative had contributed to lifting over 560,000 farmers in Burundi, eastern DR Congo, and Rwanda out of poverty,” van Asten said.